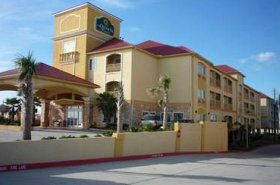 La Quinta Galveston hotel is a unique relaxing place along the Galveston beach. The hotel is on the west side of the seawall and not far from the Scholes Field Airport or the Moody Garden attraction site. The area is not congested with hotels. It's a fine place to relax and stroll along the seawall. Beach activity is is minimal around the hotel but traffic is steady through out the day. The location is nice and the parking garage is beneath the La Quinta Inn & Suites hotel. The front office side of the hotel faces the gulf. There is only partial view of the gulf. La Quinta has all the modern amenities to make ones vacation pleasant. The hotel is equipped with a breakfast area. One thing though, there is no nearby restaurant. The closest eating places are McAlister's Deli, Sonic Drive and the McDonalds. Major eating places are 4 miles to the east of the seawall. The closest attraction site is the Moody Gardens and the Waterpark. This hotel does get full in summer time. It is a recommended place for visitors to Galveston.